Hidalgo del Parral--founded in 1631 as a mining colony--would begin our [Aromas y Sabores] eye opening odyssey into the northern state of Chihuahua; rich in native-American tradition, stocked with a formidable gastronomy, a curious history of German Mennonite cheese makers, the terroir of Sotol, the grandeur and adventure of the Copper Canyon and the famous Chepe(train),the land of the Rarámuri, and the place where General Francisco “Pancho” Villa was assassinated. Our first stop was at the mine for a luncheon to sample the marvels of parralense cuisine, before exploring the city. The event gave a glimpse into the past and present of a city that was once declared the “Capital of the World” by King Philip IV of Spain for its bountiful silver strike, and now the former prized, colonial city is celebrated for its culinary strike--it ranks as one the 10 gastronomic wonders of Mexican cuisine. By the end of this leg of the trip we found that Chihuahua holds its own with any states in southern Mexico and that my own speculations about the north were validated. 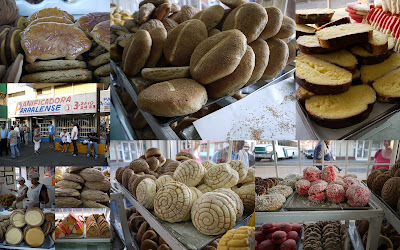 While cookbook authors and culinary travelers have focused on Puebla, Oaxaca, Vera Cruz, and Mexico City, they’ve neglected to look beyond the surface of Mexico for its cuisine. Chef Patricia Quintana gave an impromptu lecture on our bus during our Chihuahua trek that was revelatory. I’ve taken greater notice of the intricacies of chiles, tortillas, cheeses, and common dishes and flavors found all over the republic; and how they adapt in each region. Tortillas are Mexico’s canvas, painted with the colors of spring and fall in chiles. Chihuahua tourism was just as hospitable and delightful as our hosts in Nuevo Leon. They put together a tight menu of regional dishes on a patio overlooking the city of Parral. Spectacle and commotion became a routine part of our visits to each city as we snapped photos, and plunged our eager hands into snacks, noshes, and slurped down any beverage that was handed us. Pictured L-R, Liliana, Sarahi, Jahzeel, and Julieta at La Prieta Hill overlooking Hidalgo de Parral were part of the many attractions we saw in the final resting place of "Pancho" Villa. I can see why he liked it here. These young ladies and the Chihuahua tourism people made sure we all got seated--all 90 of us--for a taste of Parral. Enchiladas in Los Angeles are about the most difficult foods to find for me--hardly anyone does them correctly. Traditional enchiladas in Mexico are perfect examples of the local culture: local fillings, local tortillas, and local finishing touches. Little did I know at the time of this lunch that I was having my enchiladas prepared by royalty. Doña Cuca started in 1922 and has made their enchiladas exactly the same as day one. They are famous for their enchiladas verdes made with chile pasado, but today it was enchiladas rojas with chile california filled with queso ranchero from Chihuahua. The recipes are simple, the sauces are pure chile with a bit of garlic to allow the bold flavors of these chiles to shine. It's the same today as when Doña María del Refugio Delgado Muñoz began serving them back in 1922. At our tables Chihuahuan requeson(similar to ricotta), and asadero(melting cheee) were set out to awaken our appetites. Chihuahua has one of the most archetypal cheese traditions in Mexico. Arroz a la jardinera, a local rice dish with carrots peas and corn. Like many northern bean dishes the refritos here are fortified by pork lard for flavor and it gives the beans a rich creaminess. It was here at this event that I found my favorite rajas con crema, made with the spicier and more full bodied chile chilaca. Asado de puerco, a pork with chile california dish is used to fill burritos de guisado as well as gorditas here in this region. There is a pit roasting tradition in Chihuahua explained the young chef that oversaw our meal, "we prepare barbacoa de res underground." The barbacoa was bursting with juice and tremendous beef flavors. The chile pasado is the hardest working chile in Mexican cuisine. Take a chilaca, roast it, and set it to dry with seeds and skin intact. The chile packs a wallop that is quintessential Chihuahua. You've had pork ribs with chiles a million times, but costillas de puerco en chile pasado is an entirely new sensation. Dark, smoky chile sauce clings to the pork ribs bite after pleasurable bite. Les ingredients are used in some of these preparations because the chiles have strong flavors, and don't require all the seasoning of sauces from other regions of Mexico. For dessert, dulce de frijol, sweet cool beans topped with cinnamon and nuts. 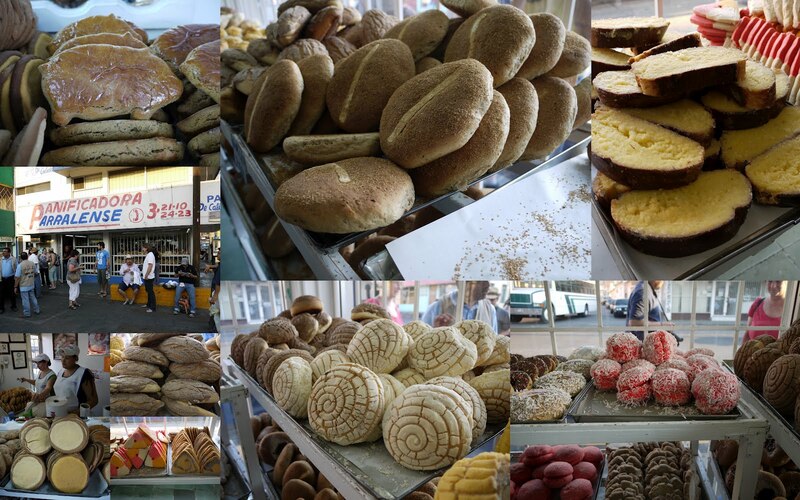 Later in the afternoon we made a few stops, first at the Panificadora Parralense to try the famous rayadas(pictured in the top center of the collage), a simple wheat and white flour bread with hints of anise. Parralenses eat these with meals and use it to make capirotada(bread pudding) in the Semana Santa(holy week leading up to Easter). This place has been around for a while, but you know, I'm not a bakery buff, BUT, I sure know when I'm in a great bakery, and this is one of them. You can see and smell the quality items all of which are fired in owner, José Guadalupe Ochoa's brick ovens. 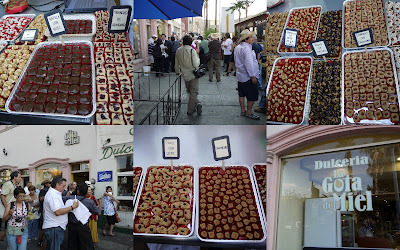 As if 90 people snapping pictures at the bakery wasn't enough, our trip over to the famous Dulceria La Gota de Miel(since 1932) peaked to a new level of media frenzy. Shutterbugs fell upon the sweets like bees lusting after the queen bee. So, I made like a hornet and buzzed off for a while to achieve one of my prime directives--a walk around every town I visit. When I came back it was still a swarm.I spoke with a photographer who was taking pictures of all the other photographers climbing all over each other to get their shots. "This is crazy", he said. Once the clicks of digital cameras ceased then it got even more intense as lots of locals as well as people from our group snatched up handfuls of treats made from a base of milk and nuts, and stuffed them in goodie bags. I waited 'til it was over and settled for what was left, and even the less desirable items at this well known sweet shop were delicious. We happily chewed on our bite sized candies in tourist cars on our way to have our first sips of liqour that day, besides the beers I had at lunch of course. OK, second sips of alcohol that day. At the Leyenda de Chihuahua distillery, we were greeted by General Fransisco Villa--or at least a good likeness--to sample the spirit of Chihuahua: sotol. 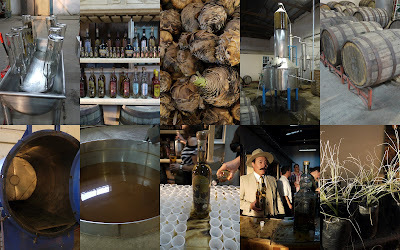 Sotol, or Desert Spoon, is available in the United States from the Hacienda label, but many other makers exist in Chihuahua, Durango, and Coahuila. Of course we visited the Museo Francisco Villa, erected at the exact location Pancho Villa was ambushed on Friday, July 20th, 1923, as he and some bodyguards and staff road by in his 1919 Dodge Roadster. The retired general had come into town to do some banking as a pumpkin seed vendor ran up and yelled Villa! Villa! Seven riflemen then emerged with guns blazing and killed all but one passenger including the legendary General Francisco Pancho Villa. A total of 9 bullets hit Villa, killing him instantly. Our dinner was a gala event that was attended by a portion of our weary group. But we couldn't proceed without booze, so I grabbed famous southwestern chef and restaurateur, Mark Miller, for a booze run. Another chance to explore. We finally found a place that would sell us some beer at that hour, a dive bar that had a pile of dirt as you walked downstairs, and you had to walk past a vacant 35 yards of space before you reached light and bar folk. The women working there couldn't figure out why we wanted beer to go, but after playing with us a little bit they made a care package for us. "You're not going to open this in the street are you?" "Of course not", we replied. Just another day on the road with Aromas y Sabores, an unforgettable journey on the northern route, and a rediscovery of Chihuahua's culinary treasures, and a tale of Hidalgo de Parral, Chihuahua, the Capital of the World. Thanks so much Leslie, for sharing. You made my day! The asado, costillas and enchiladas all look ridiculously good. Nice write-up. Tanks a lot !!!! muchísimas gracias amigos por este magnifico reportaje, Parral siempre estará con los brazos abiertos a esas comunidades, hay mucho que ver y disfrutar.....an embrace all to you ! !